March 7, 2016: Development on PeeWeeLinux has seized a long time ago. But for nostaliga sake I restored the 'pwlconfig' scripts on GitHub and this related website on GitHub Pages. 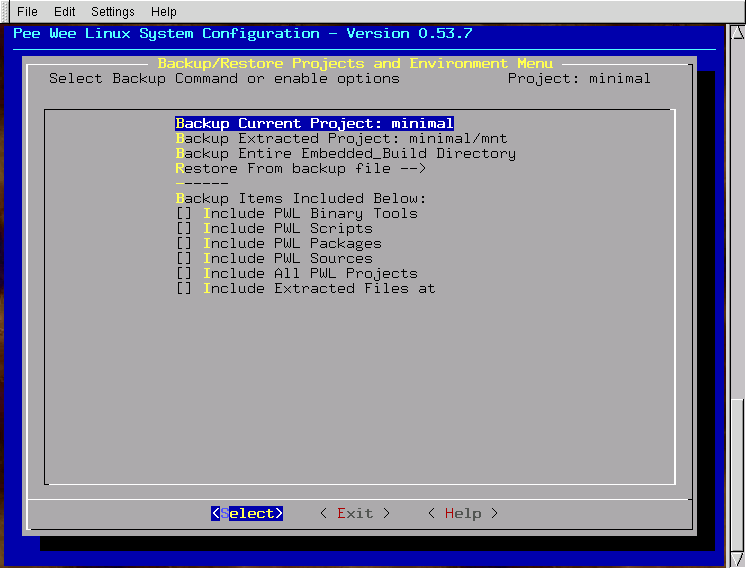 Many of the original project releases can still be found on SourceForge. October 2, 2004: The peeweelinux@adis.on.ca and peeweelinux-devel@adis.on.ca mailing lists are no longer. Both lists have been replaced by a new mailing list on SourceForge. The old mailing list archives have been preserved. March 8, 2003: It has been really quiet on the PeeWeeLinux development front for me this past year. The project hasn't been forgotten, just neglegted. There's no lack of ideas but no time to actually do it. The CompactFlash to IDE adapters are now available on my Adi's Electronics website, at http://adis.ca/store/. February 26, 2002: Just release a maintenance release of PeeWeeLinux. 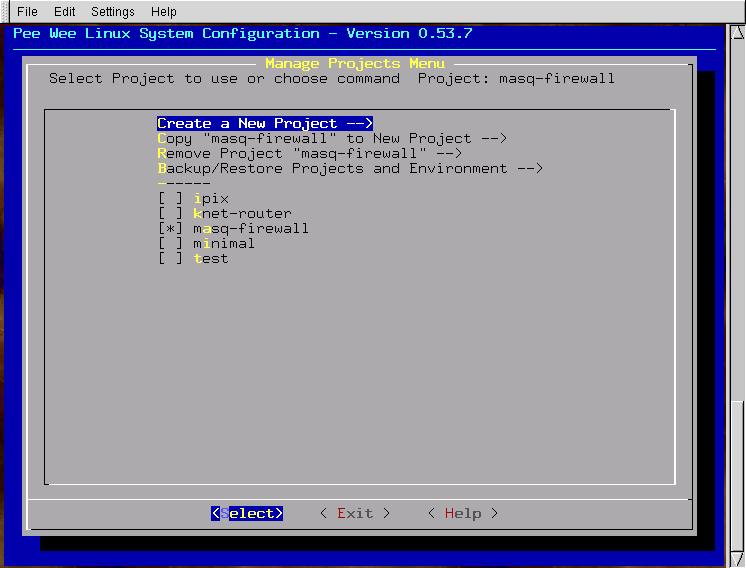 The pwlconfig configuration utility relies on ncurses. Added lxdialog from the kernel sources to PeeWeeLinux and modified pwlconfig to build a lxdialog binary on first run. This should fix issues with using PeeWeeLinux on post RedHat 6.2 systems. The new 0.61.1 release is available on SourceForge and ibiblio. March 5, 2001: A number of new applications were added to PeeWeeLinux. Mostly to support audio streaming. The list of changes can be found in the Chenagelog. The basic kernel has been revised with the addition of tunneling and bridging. PeeWeeLinux 0.61.0 is now available for download from http://www.ibiblio.org/pub/Linux/distributions/peewee/. January 27, 2001: A new PeeWeeLinux beta release is now available! Version 0.60.1 includes the new kernel build feature in pwlconfig. This will allow for a custom kernel package to be build right from within the pwlconfig environment. The updated pwlconfig files can be found at peeweelinux-0.60.1-cfg.tar.gz. 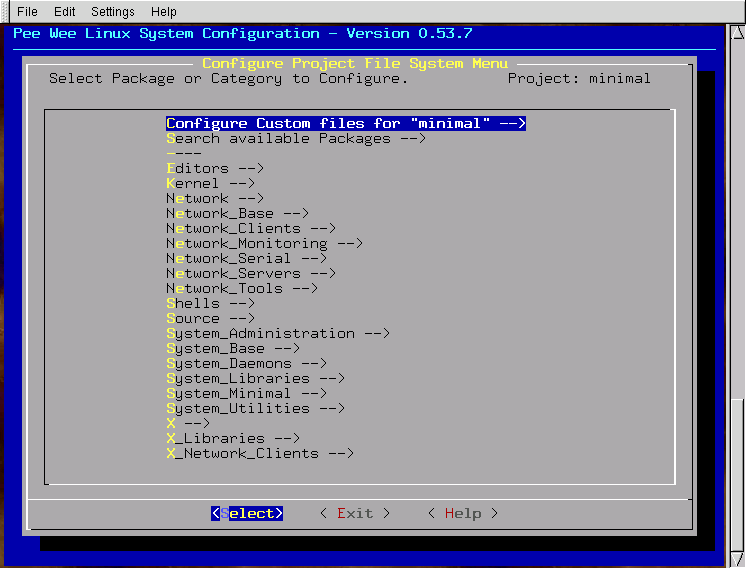 The configuration utility is menu driven and allows for complete packages, or a subset of files from packages, to be included in the target system. Target system using syslinux or lilo bootloaders are supported. Targets can consist of root ramdisks, read-only root partitions and conventional single read-write root partitions. Projects can be saved for later use; thus making it very easy to test several different configurations. The PeeWeeLinux kernel sources include a number of important features for embedded applications; like GPL compliant drivers for flash devices, the latest available network drivers, USB and PCMCIA support. PeeWeeLinux as a whole is distributed under the GPL license. Individual packages and components are licensed per their respective owners. Download locations for the complete PeeWeeLinux distibution are listed in the download section. PeeWeeLinux is available free and there are no hidden costs or royalties for using it. So a picture speaks a thousand words? Here are some screenshots of the pwlconfig configuration utility for PeeWeeLinux 0.53.7. Click the image to see the full size screenshot. PeeWeeLinux is now available in three formats. Only one of these files is required to have a fully functional development environment. PeeWeeLinux is available free from the download locations listed in the download section. To purchase any of these products go directly to the Adi's Electronics store. 3.5" CompactFlash to IDE Adapter. 2.5" CompactFlash to IDE Adapter. Plugin CompactFlash to IDE Adapter. 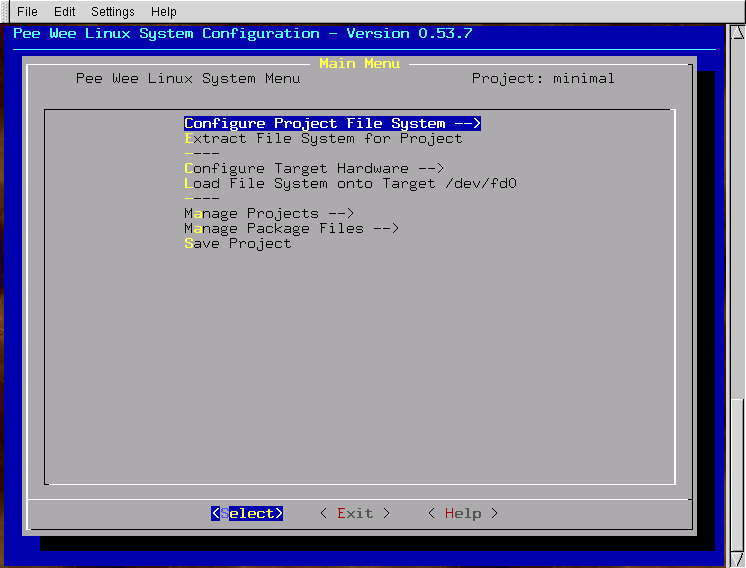 The PeeWeeLinux development environment requires a pre-existing Linux system with a complete set of development tools installed. PeeWeeLinux is currently developed on a RedHat 6.2 system with some updated packages and a not necessarily a stock kernel. Currently the loading of target devices directly attached to the development system are supported. These include floppy drives, IDE hard drives, scsi hard drives, M-Systems Disk-On-Chip and CompactFlash devices. CompactFlash has been successfully loaded using PCMCIA adapters and USB readers. CompactFlash to IDE adapters are ideal for attaching a CompactFlash card to a target device. They are currently being used with great success inside the K-Net Router, Datalux IPIX and many other embedded boxes in lieu of a common hard disk drive. Feel free contact me with any questions. PeeWeeLinux is supported through a mailing list. You can subscribe to the mailing list, or you can access the list archive. Prior to October 2, 2004 PeeWeeLinux had two mailing lists. The archives for these older lists are still available and contain valuable information about PeeWeeLinux not found anywhere else. Any help in producing useful documentation for PeeWeeLinux would be greatly appreciated. Any volunteers? For now the mailing list and its archives are the best resource for information. PeeWeeLinux was created out of the need to develop a small crash proof satellite router for K-Net. The idea was to build a flash based system that loads the operating system into a ramdisk thus eliminating any risk of corrupting the filesystem due to power failures, brownouts or even operator errors. In essance an embedded Linux system. The first K-Net Router was build on a RedHat 5.2 platform. The operating system was assembled in a way similar as described in the Bootdisk-HOWTO. Most binaries were taken from the running RedHat 5.2 development system. The exception were some system utilities which were compiled to depend on less libraries. When the system was run on the target platform it became evident that there were significant problems because the 2.0.35 kernel would not support vital features of the motherboard used. Migration to RedHat 6.1 with a 2.2.12 kernel was the answer. But this move also meant a tremendous amount of additional development work since RedHat 6.1 was based on a different libc version. PeeWeeLinux was conveived to make the process of building an embedded system repeatable and reliable. The tedious task of stripping each library and binary and ensuring that dependencies are met had been done when the PeeWeeLinux packages were build. Eventually Ralph Stickley became interested in the PeeWeeLinux development environment to develop the operating system for the Datalux IPIX. He created and maintained 'pwlconfig', the ncurses driven configuration utility, and he was the driving force to add X windows and X dependent applications. Today PeeWeeLinux is actively being developed and used. Work is underway to keep PeeWeeLinux at the cutting edge of Linux development by including the latest stable kernel versions and increasing the applications and utilities available. Features are being added to 'pwlconfig' on an ongoing basis. Feel free to contact me if you have any questions, suggestions or bug reports. If you are using PeeWeeLinux I would encourage you to post your questions to the mailing lists. A much braoder audience is reached via the lists and response times tend to be much quicker. The listed individuals have made contributions to PeeWeeLinux.